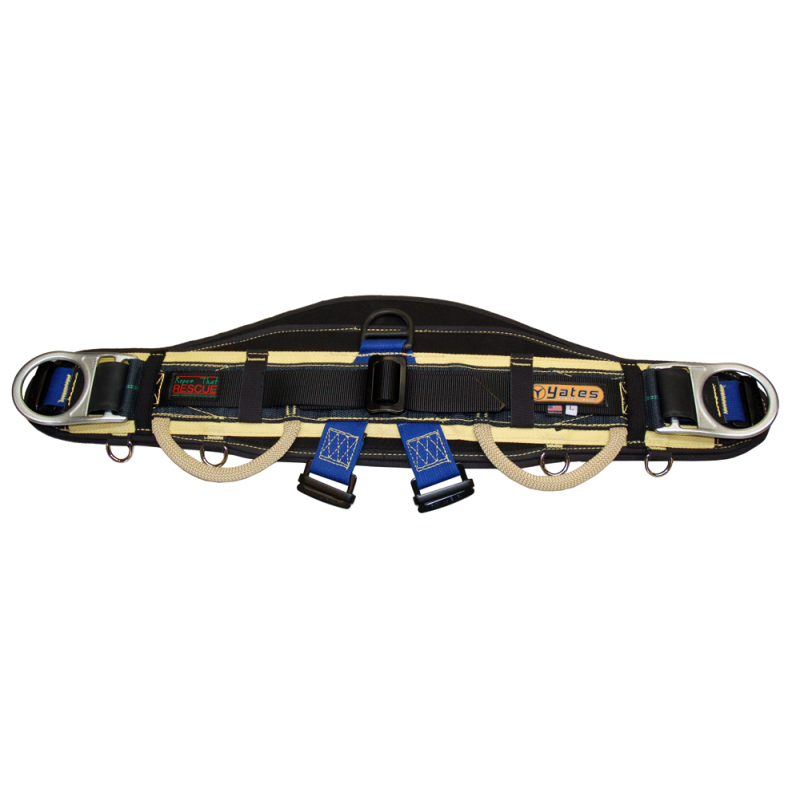 The XL is a DEMO Harness that will receive a $200 discount. THis shows very slight wear and was used at a Instruction curse for one of the utility companies. In conjunction with transmission line rope access pioneer, Reed Thorne of Ropes That Rescue and other western USA utilities like Pacific Gas & Electric, Yates has designed the 390FRA harness to meet the needs of the transmission tower worker who is utilizing rope access techniques. The 390FRA Harness is designed and recommended for helicopter external load short haul work. The 390FRA harness has a more flexible waist pad system than the 390FRC Harness. 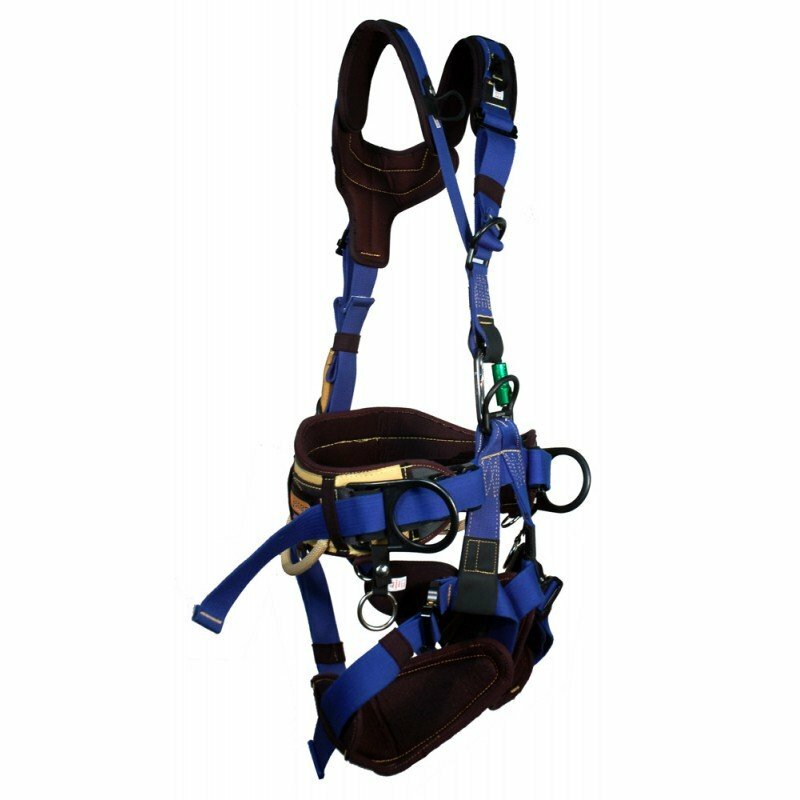 This harness was specifically designed with electric utilities helicopter short haul programs in mind. The 390FRA Rope Access Lineman Harness meets the stringent requirements of ASTM F887-05 Electric Arc-Flash rating for personal climbing equipment. Many new features are seen in the New 390FRA harness. 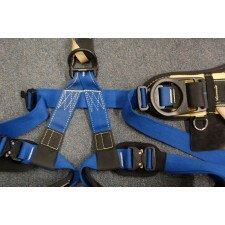 Cobra quick connect buckles on the waist portion of the harness, ANSI carabiner to attach chest to seat. Constructed from webbing which is a blend of Nomex in the exterior for comfort and durability and Kevlar in the interior for strength. Specially designed for the professional transmission tower worker. Wide anatomical waist pad for increased comfort and added back support. Modular work/tool pouch system allows the user to customize each harness to their own arrangement. 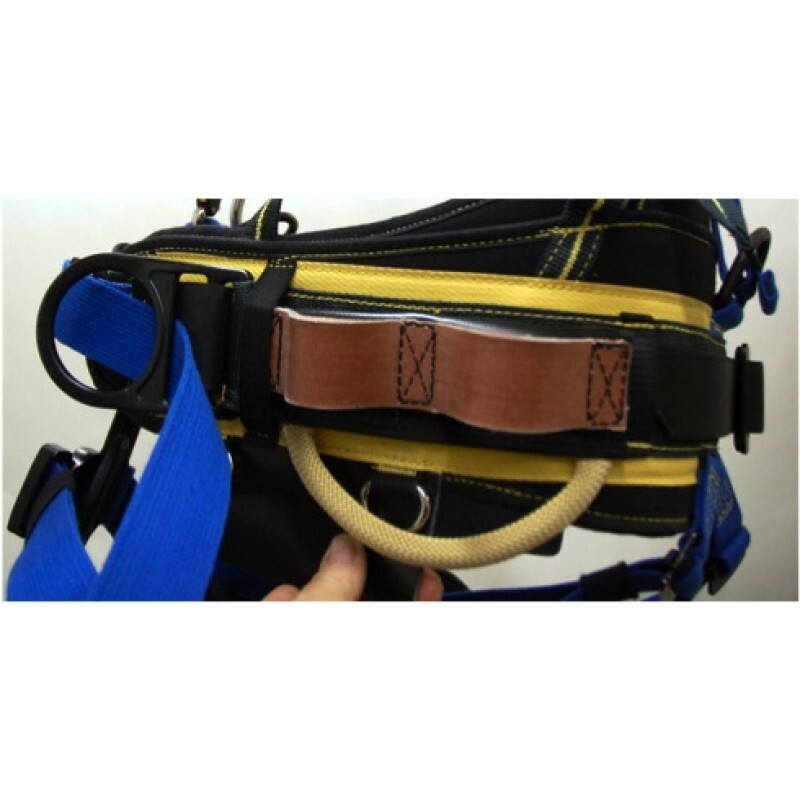 Easily adjustable for variations in clothing by use of camlock and cobra buckles. Attachment points at waist, hips, chest, back (lumbar) and back (dorsal). New U shaped rear shoulder design distributes load evenly across the neck of the user. Milled Aluminum COBRA quick now used to connect waist belt to waist pad and to connect leg buckles for easy donning. 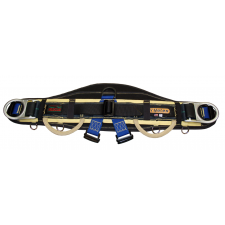 COBRA buckles are ANSI Z359.1 -2007 certified. Weight 7lb. (3.3 kg). Petzl S & L Auxillary Caritool Tool Holders and Yates Tool Holsters sold separately. Trapazoid screw link and new adjustable sling to attach the Petzl Croll sold separately.(Part#1781CROLL). NOTICE: 390FRA Harness is only recommended for use in a work environment where Arc-Flash hazard exists. 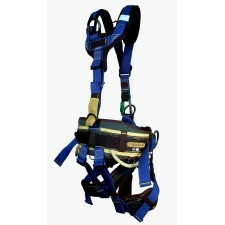 For daily work use in non-energized situations the standard 390RTR harness is recommended. The Nylon webbing which 390RTR the harness is constructed with is much more durable and abrasion resistant than the Nomex/Kevlar webbing used in construction of the 390FRA Harness. NEW 390FRA Harness for 2015 now comes in Mesh/Cordura duffle bag. 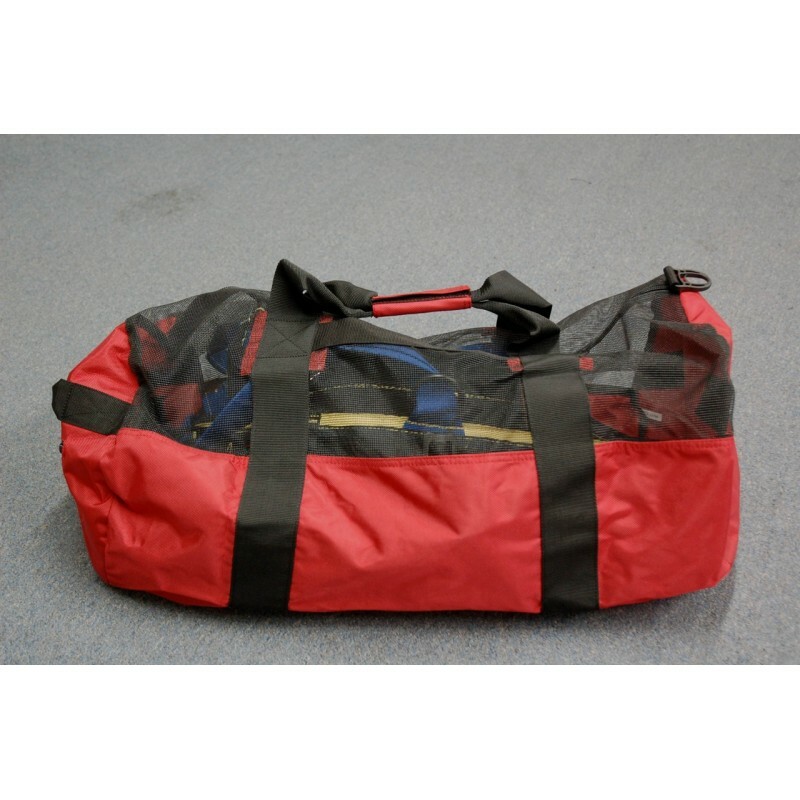 Duffle bag designed to breathe because top portion is constructed using a heavy duty mesh material. • Certified by UL to the new ANSI Z359.11-2014 and ASTM F887-13.